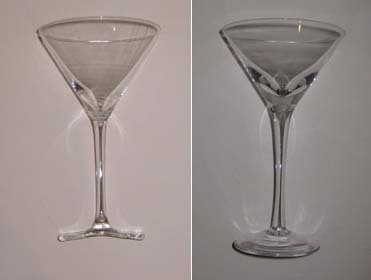 I’m starting with two martini glasses, both purchased from the thrift store down the street. 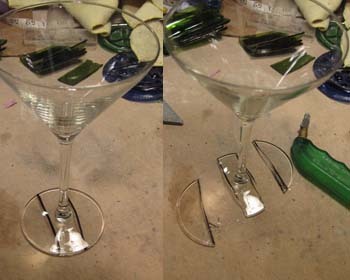 This started out as an experiment to see if it was possible to melt a martini glass flat to use for other projects. One of the martini glasses goes into the kiln whole. The other one is marked and then cut. 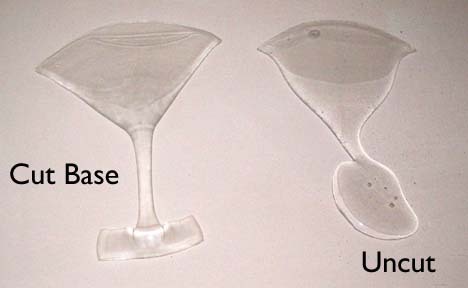 By cutting off either side of the base, we can make sure the glass won’t roll when it fuses. 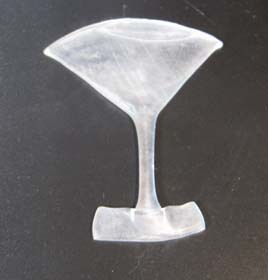 Martini glass with a cut base before firing. Fire with a regular firing schedule, and guess what you get? I would like the base better if it weren’t quite so square, so we obviously have some refining to do. I’ll revisit this project again and do some actually complete projects with glassware.